Here's an adorable purse I made for my sister for Christmas. I am in love with Heather Bailey's Pop Garden fabrics. This purse took only about 2.5 hours to make. I plan on making one for myself soon- it would be a great little purse to carry your scriptures in for church. It's hard to tell from the pictures, but there are 3 pockets on both sides of the purse- on the outside. So fun! I made this purse for my sister in law, Missy. I am in love with this bird fabric by Alexander Henry. I made this in early November as a Christmas present for my sister-in-law, Melanie. I really love these Amy Butler fabrics! Here is the purse I made in October for my mother-in-law, Julie. I am in love with these fabrics- they came from a fat quarter set from Joann's. Those packs always have the cutest prints, but you never find the same things on the bolts. As promised, here are some of the really cute quilt blocks I won at last month's Chelmsford Quilting guild UFO auction. Aren't they adorable? The only problem is that there are about 4 blocks missing- V, W, X, and Y. It's going to be a challenge to make my own, but I will figure it out. This weekend's project, besides working on Christmas presents, included making the next block in the block exchange. This one was CHALLENGING! I was so glad when I discovered that the person who had made the block had stuck in several "extras" of the triangle units- but despite this help, I used the seam ripper quite often. 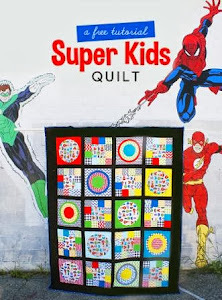 It's projects like this that remind me that I desperately need to take a quilting class because I am self-taught and could really use some real instruction. Here are the two blocks that came in the box I received. This is my block. I am pretty happy with how it came out. Even though I am not a dog person, I absoltely love this pattern and maybe someday I can make my own for a nursery quilt sometime. And just for old time sakes, here's some fun and very bright fabric I bought at the local quilt store, Candlelite quilts. I absolutely love it. Less than two weeks till Christmas! Then I will finally be able to post all the many projects I have been working on for gifts for family. Here is the original block I had to copy for October's quilt block exchange. A country version of Jacob's ladder: The lady provided a "Nifty Notions" ruler that was quite helpful in making the triangle parts. I definitely procrastinated this small project- I made it the night before the meeting. I won't be able to do that with the next block.... Wait till you see it! I will post pictures soon. I have a lot to catch up on here. Last week's quilt meeting was a blast- it was an auction of everyone's castoff unfinished projects, unused fabric, books, and tools. If I had more money- I would've gotten a lot more than I did. But I was able to come home with an unfinished baby quilt I absolutely adore. I will post about that later this week. And some fabric for a Christmas present, a purse, and a sewing themed quilt I am planning. Isn't it so cool how they fold the fabric for you like this? This year I am participating in the Chelmsford Quilt Guild block exchange. They made this activity geared for beginners because in years past the "exchange" activities intimidated less experienced quilters. Basically, I had to pick a block design, make one block, write up the instructions, and submit it to be passed around from month to month - and in April I will get a bunch of blocks from people.... Meanwhile, I have to make a different block each month for other people. I will post a picture later of the block I have to make this month. I am excited- but we'll see what the ladies do with mine- it might be difficult because the quilts they all make are very "country." I'm pretty sure someone embellished this skirt with felt birds and leaves, that it wasn't manufactured like this. I think the print on this is gorgeous. Unfortunately, it doesn't fit as it is- I would be lucky to be able to fit my thigh in the waist part. But I am pretty sure I can alter it to knee-length. The tag says it was "Hand printed in Finland." Here's a purse from Amy Karol's Bend the Rules Sewing Book, "Pleated Bag Beauty." This is the first time I made one, and I am in love with how it came out. It was a somewhat intimidating project at first, but it went really well and I actually didn't make any major mistakes. I am especially pleased with the fabric combination- both prints are butterflies. This is going out to a friend as a very belated birthday present. This whole set of "fairy tale" dolls was only .50 cents! I couldn't believe it! They're all in really good condition and very adorable! Can you see Red Riding Hood? Jack and Jill? Mary and her lamb? This will be fun to decorate a nursery someday. 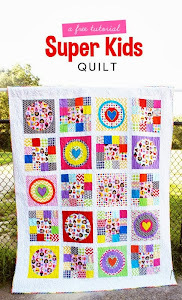 A retro cheater quilted panel- I LOVE all the colors! Can you work miracles reusing fabric? Do you thrift like a demon and have an amazing knack for sensing a yard sale a mile away? Misers can see project potential in cast-off items and can make gifts from pennies. The flip side can be a tendency not to cut enough fabric... If you thrift fabric, often you have little control of the quantity. So you tend to have not quite enough. (Or you are being a miser, and don't want to use it all). Misers will undercut the fabric, making it stretch as far as it can go. But scrimping on seam allowances comes at a price: no matter how clever you are, you cannot make up for not having enough fabric. Attention misers: Stop waiting for the "perfect project," keep your fabric stash in check, and don't buy fabric only because it's on sale. Buy what you love- and use it liberally. I don't think all of this applies to me, but it is true that I LOVE a good yard sale and often eye the goods in a thrift store with the intention of cutting up the clothing, not wearing it. So I decided to change my blog up a little, as you may have already guessed based on a few of the most recent posts. Since my full-time job seriously interferes with my life, I don't sew as much as I'd like to. Also, most of the projects I am working on right now are Christmas presents that I need to keep secret till after Dec. 25.... So I am changing things up a bit by posting yard sale finds (related to crafts) and maybe I will do some other different themes- like posting favorite handmade posessions that I didn't make or things I made a while ago- just to keep this thing current. I recently scheduled a ton of posts- and it is kind of fun to check my blog and see a new post that I had scheduled recently. Anyway- over the past weekend I made these "simple bibs," also from Bend the Rules. I used some of my vintage fabric and applied adhesive ribbon meant for scrapbooking (I hope it washes okay!) I gave them to my friend Lindsay who is going to have a baby boy in about two weeks. Any ideas on crafty things to do with vintage bow ties? This set was $2. There are probably at least 50 in each of these boxes. Both boxes were $5 each. At work each department had to decorate a pumpkin without carving. We did a "V.I.P" (Very Important Pumpkin." It was my idea to add the Papparazzi Pumpkins and I made the cute little felt bushes they were hiding behind- I should've taken a closer picture of them.... We won 3rd place.